Fitness For The Rest of Us: Laurence King Publishing Presents: FUN & Educational Interactive Books, Puzzles, Games & MORE! Laurence King Publishing Presents: FUN & Educational Interactive Books, Puzzles, Games & MORE! Holiday shopping season is already upon us. Before you start looking for those great gifts, check out Laurence King, they publish interactive art books, maze books, story-telling cards, and educational seek-and-find and memory games for imaginative children. For fun-loving and curious adults, Laurence King publishes trivia games for film buffs, themed bingo games for Family Game Night, card games with fashion themes, and guided journals for architectural doodling. Books and subject areas include art, graphic design, photography, architecture, and fashion design, history, and sewing. They have something for everyone on your list this season. They have such a huge line of fab gifts, from sketchbooks, stationary, placemat art, dice games, puzzle kits, and so much more! Check out their great gifts here. Keep reading to learn more. Laurence King is famous for producing artful and distinctive games, books, and gifts reflecting high production values. They may be best known for publishing the worldwide bestselling coloring books, SECRET GARDEN and ENCHANTED FOREST. Based in London, the company enjoys worldwide distribution. Check out their line of gifts that are perfect for gift giving this holiday season. I love giving gifts that keep the kiddos minds going. Give them something fun & educational to do this holiday season. I had the pleasure of reviewing some of their awesome gifts - and my nieces LOVE them. Perfect for girls & boys and fun for a HUGE age range. Yes my teenage nieces even joined in the fun. Ok maybe I did too. Have you ever dreamt of bringing the weird and wonderful creatures of your imagination to life? Or having the most amazing monster line-up on your shelf? 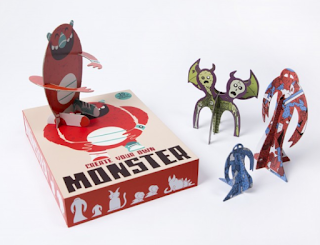 For all the monster enthusiasts in your house, this fun box-set includes 15 different templates, 12 of which have been gruesomely illustrated by trend-setting artists, plus three blank DIY sheets for you to customize with your own designs. We had a lot of fun with this! Let the creativity flow. Create your own set of cute and scary monsters to play with and line up in a colourful display, or to send to friends using the specially designed envelopes included in the box. This kit makes a great fun day of crafting & imagination with your littles. If you have a cat lover at your house. This is the game for them!! We had so much fun playing this & all the "ooohs & awwws" about the cute cats confirmed this was a winning choice. 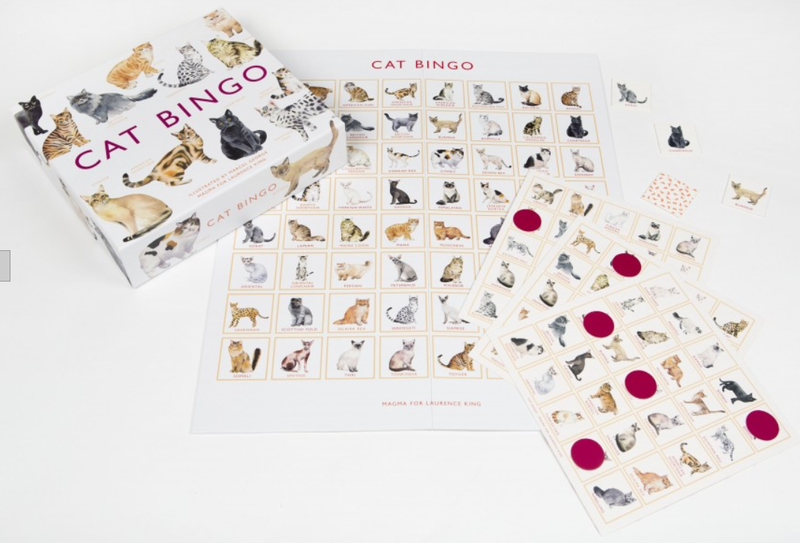 A beautifully illustrated bingo game featuring 64 breeds of cat from around the world. Spot all kinds of cats – from Tonkinese to Siamese, and from Bengals to Birmans – mark them off on your card and … BINGO! 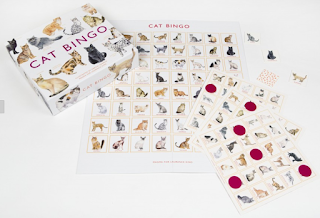 Cat Bingo brings a fun and educational twist to the traditional game as players learn the names, colourings and characteristics of their favourite breeds. We had so much playing & learning. The box kit contains 64 superbly illustrated cat tokens, one playing board, 12 bingo cards and brightly coloured counters for you to mark up your card. Also includes a leaflet containing information on each of the cats included.